World of Darkness: Gotham is a Classic World of Darkness Online RPG set in current modern day New York City that ran over AOL from 1999-2003 and has been revamped, updated and moved to an internet chat platform in order to celebrate White Wolf's 20th Anniversary of Vampire: The Masquerade and it's other top venues: Mage: The Ascension, Werewolf: The Apocalypse. The focus of this Chronicle is to offer cWoD fans a gripping campaign setting that delivers a classic WoD MMORPG Chronicle which is heavy on horror, intrigue, mystery, suspense, and drama. 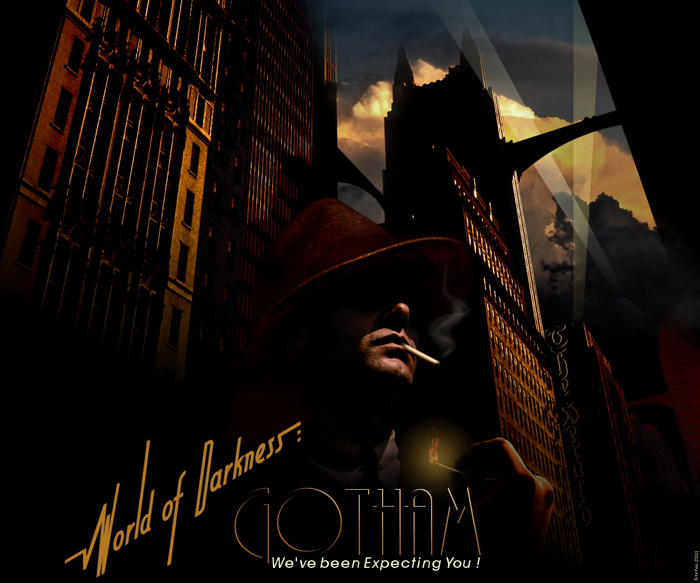 The moods and themes of World of Darkness: Gotham (WoDG) are heavily influenced by Lovecraftian and film noir elements. In other words, this is a Chronicle that will deal with mature themes as they relate to the World of Darkness - horror of both a personal and an external nature. Player characters will be challenged to survive and thrive in a highly charged and competitive atmosphere as they are forced to beat back friend and foe alike for their slice of the Big Apple. This is a crossover Chronicle. WoDG's venues include Vampire, Mage, Werewolf, and Mortal (Mafia, Project Twilight, Hunter's Hunted). As such we use a heavily modified version of Revised Edition which blends some elements of all editions of cWoD in order to facilitate a consistent and sensible crossover experience.